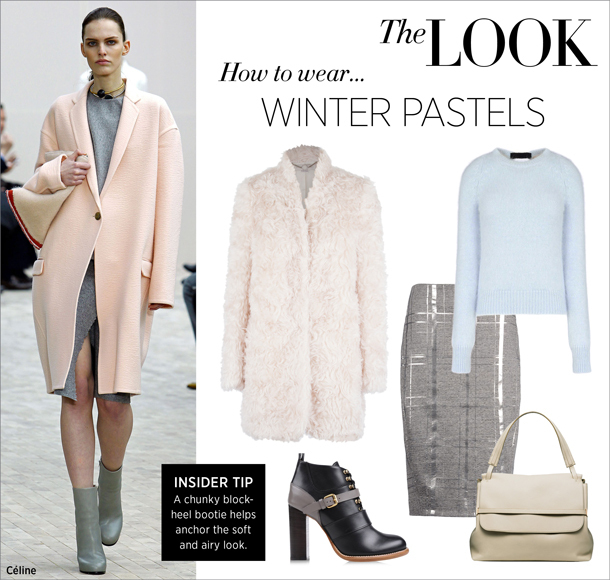 Soft, feminine pastel shades are not just for spring and summer. In fact, light hues (i.e. lavender, blush, and periwinkle) are having a major moment. Think of them as a refreshing alternative to the season's typical navy and black palette. To give these cotton candy hues longevity until New Year's and beyond, pair them with a grounded neutral (think grays and tans) and/or rich jewel tones (such as sapphire, emerald, and burgundy). In fashion (and in beauty), burgundy is one of Fashion Week 2015's hottest hues. Treat it as your replacement for gray and navy; trust, it truly is that versatile! These ankle pants from Ann Taylor, also featured here, are super comfortable and super polished. I've been throwing them on with pretty much everything lately. Blush and burgundy is a killer combination that I've been seeing everywhere lately (here, here, and here...just to name a few). It's sophisticated, sharp, and quite fresh. If you're looking to modernize your look, start with joining these key colors. Whimsical necklace layering is a definite fashion 'do.' I love this particular piece because it's one necklace but looks like multiple - I often have people ask me how I was able to find such perfect chains to create a layered look. I love it that this piece makes it look like I put more effort into my outfit than I actually did! 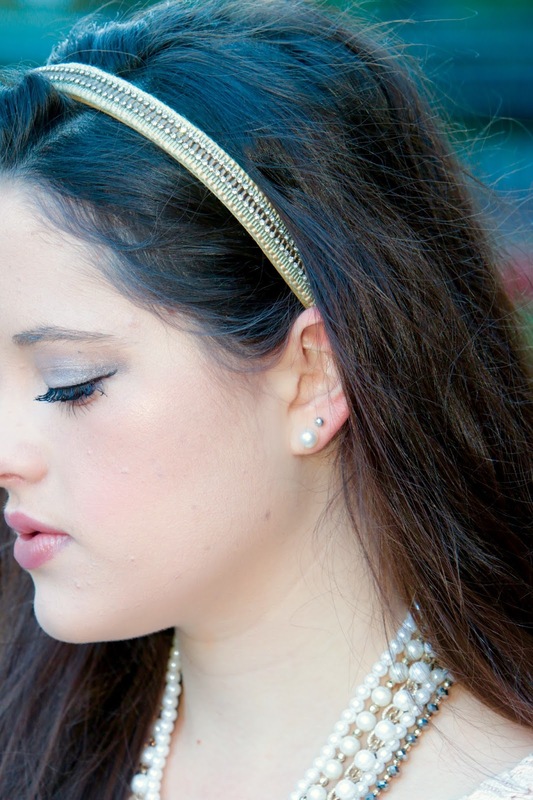 I chose pearls and a glittery gold headband to play up the softness of my blush sweater. Feminine accessories truly accentuate the delicate vibe of this light hue. 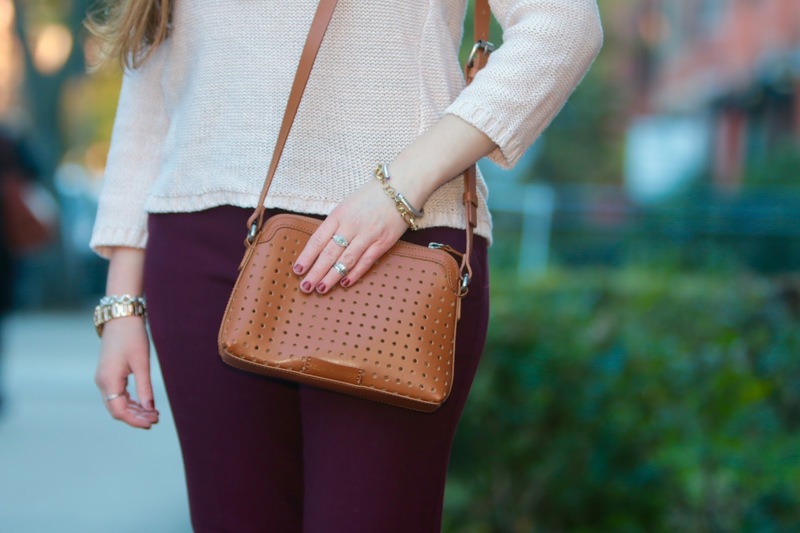 Although the rich chestnut color of this purse is gorgeous and versatile, what really drew me to this bag is its perforated leather exterior. It's such a unique piece and I knew I had the perfect crossbody on my hands when I saw how it matches my Sam Edelman booties to a T. But I have to give credit where credit is due, my mom picked this bag out for me - she has quite the eye! For this look I accentuated my eyelashes and lined my eyes with black eyeliner (pencil on bottom, liquid on top) to make my peepers really pop. I kept everything else soft and light. These photos were taken in Boston just a few weeks ago when my family and I took a long weekend trip there. Boston is a typical getaway spot for us and we've been just about every year for the past five years. 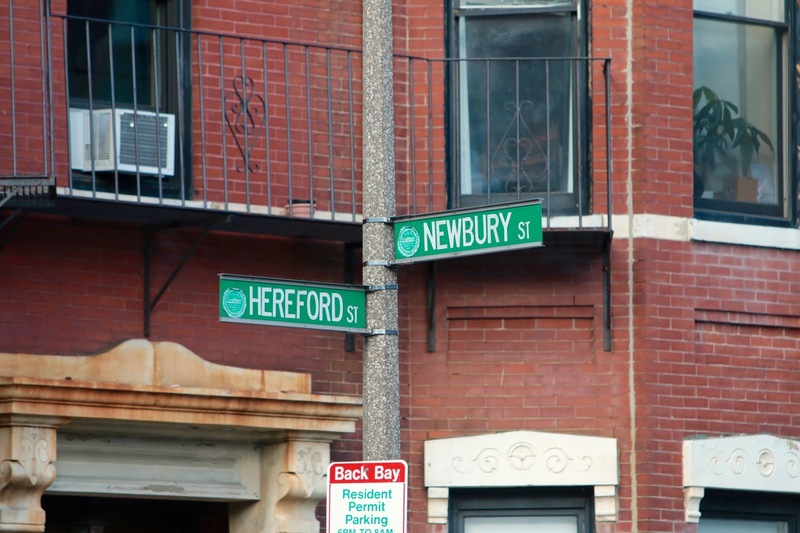 Boston definitely has a special place in our hearts and we never leave the city without a trip to Newbury Street (aka one of the world's most premier shopping destinations). These photos were taken there! lovely pictures girl love it! Nice collection you got dear. I love the pants - great colour for fall. the burgundy and cognac colours are so beautiful together! Loving the pearls too. So funny until I saw the street signs I thought you were in Brooklyn. And yes blush and burgundy are having a moment, these colors look great tougher on they look nice on you. And lover your makeup too, the silvery shadow is so cool. Such a great look! 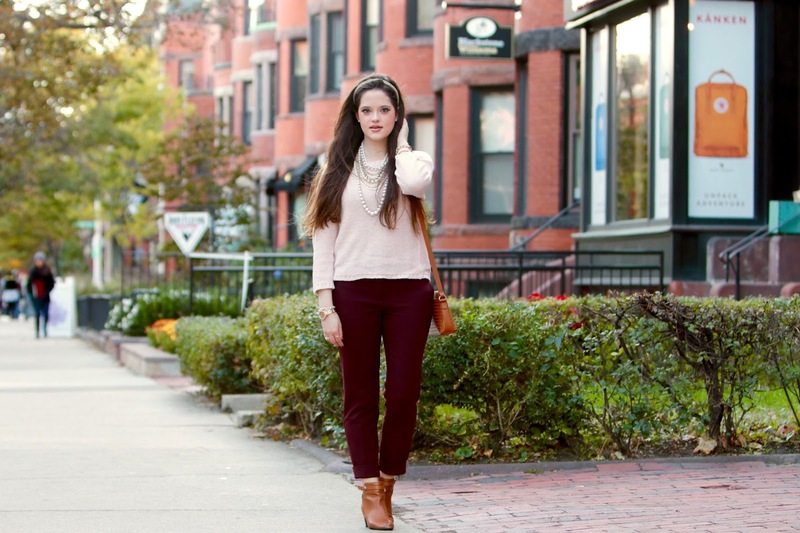 Love your burgundy pants, perfect for fall! This is such an unexpected yet gorgeous color combo!!! You've convinced me that I need to get something blush for fall/winter! I really love how you paired it with burgundy! Perfect combo! I totally agree- I love the light colours for all times of the year also. You look amazing here. So simple, so chic... I love the pearls touch!!!! My favourite part would definitely have to be the necklace -- what a great, versatile piece. You look lovely, Kat, and gosh, light hues have been having their moment, haven't they? The colour combo is such a pretty one! Such a pretty color combo! You look great. Great fall outfit! Love your necklace! Looking absolutely beautiful - lovely outfit! Such a chic color combo! 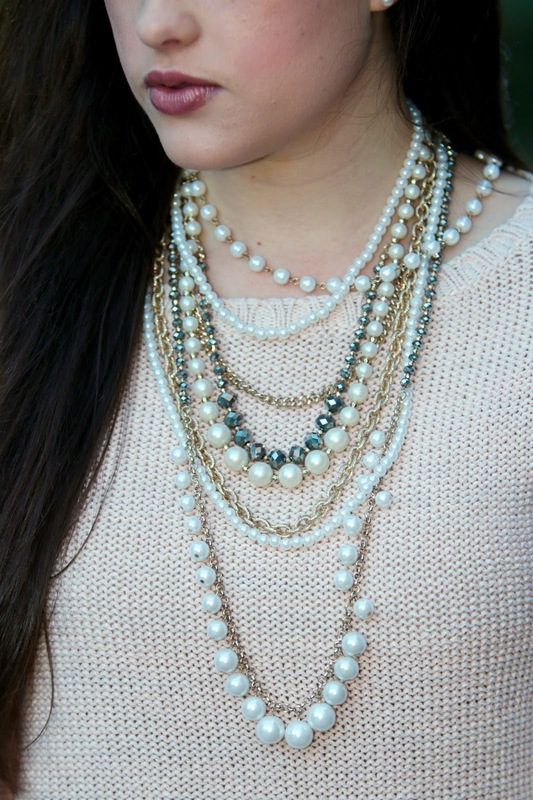 Love your pearls! I absolutely love these shades for the colder months, they look so feminine and soft, as you said. 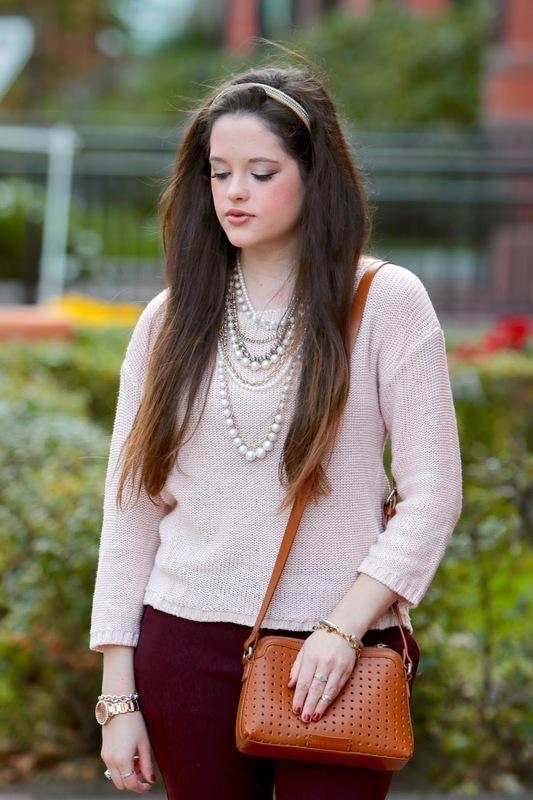 The layered pearl necklace accentuates perfectly that girly vibe of the outfit. Burgundy is definitely my go-to shade for fall- I looked in my closet after unpacking all my fall clothing from last year and filling a few gaps that like 1/3 of my closet is now shades of wine. I'm not mad at all though. Your color combinations are on point! I love burgundy with cognac. I'm loving the combination of burgundy, blush pink and tan. In fact, I love it so much, I will definitely be using this as some outfit inspiration for myself! I am a big fan of burgundy! cute look! I love your trousers! Such a great color! I love burgundy, it's so perfect for Autumn. Your trousers are fab, you look lovely! I like your outfit, but you did such a great job accessorizing that I can't help but be distracted by your beautiful pearls and that headband!! In love with your hair. So beautiful! Your look is awesome lovely!! Wish you a lovely day and love to keep in touch. with a pair of leather pants. Burgundy and brown is actually so perfect together! love how you added blush - different shades of pink are so pretty together. You look stunning! Such a great color combination! You look beautiful! Great fall outfit! Love your Great fall outfit! Love your make up! You look stunning! I just adore those pants! Love your sweater and bag!! You looks gorgeous! Your are really beautiful and you have chosen the correct outfit suitable for you. It is really good to find blog post like this here! Thanks for sharing it with beautiful illustrations. I think you look super cool in brown tones, I love the boots, in my dream I wish I was an ant being crushed by your lovely boots ! !